Our whole weekend was spent celebrated our little Q's 2nd birthday. On Friday night, I made his cake and some other treats for his party. We also celebrated Dave's year end at work with some wine and beer (and chips!). He had a great year! On Saturday, we woke up with this two year old. He had some cheesy scrambled eggs for breakfast (along with his yoghurt of course). Then we helped him open his presents. He would have been happy with the first one he opened, but once we coaxed him to the others, he figured it out and enjoyed them all. E was so eager to help him out, we had to remind him a few times to let Q do it himself. We then got everything ready for the party (while watching the Ryder Cup of course). When it was almost time for the party to start, the boys waited by the window for our first guests. Waiting for the cake. Thank goodness the daycare made this hat for Q, he wore it for most of the day. After our guests left, Q was more than ready for his nap. E and I still had some energy so we went for a bike/run (I ran, E biked) and checked out the jumping salmon in the Humber. When we got back, Q opened the presents from his friends. This is a little vet kit and both boys are enjoying it. Our neighbour texted to say they were at the playground so we went over there to kill some time before our dinner reservation. And then one family decided to come to dinner with us, so we all walked up to Queen Margherita Pizza. Always a popular spot, and everyone ate their meal and were well behaved! Bonus. Quick photo with my big boy before bedtime. On Sunday we went to church in the morning. After we got home, Q napped, Dave and E went to the mall to look for sneakers, and I watched This Is Us and did some work. When Q woke up I took him to the grocery store and then we went for a walk. Didn't see too many fish jumping, but it was still nice to be out. Hamburgers on the BBQ, yoga for me, and recorded SNL capped off our weekend. 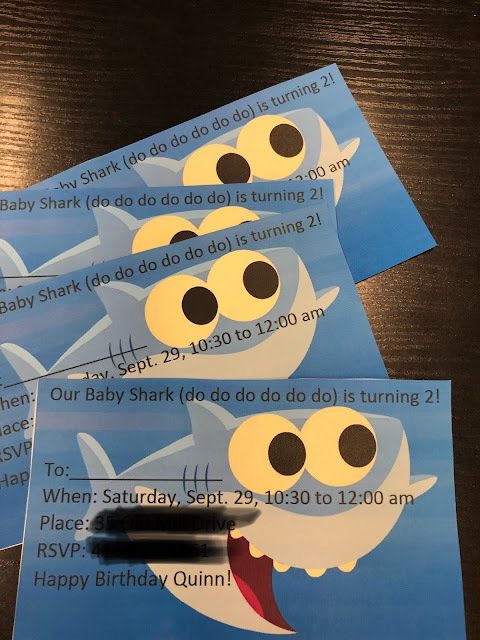 I made these cute little invitations and hand delivered them to our guests. We invited a couple of neighbours and a few friends who have kids Q's age. Treat bags with a toy shark/whale/dolphin, bag of goldfish crackers, and "Shark Bait" cookies. Cookies with chocolate chips, skor bites, pretzel goldfish, and sprinkles. Our cake. Homemade white cake with buttercream frosting.